The life of a crane operator was spared yesterday after his crane tumbled over a bridge. The worker was operating the crane while working on a bridge, lifting steel. Suddenly, the crane went over the edge and fell 28 metres. After falling some distance, the worker became trapped within it. People attempted to free the man, who had been knocked out unconscious. After attempting various methods that further endangered the man, the rescuers decided to dig below the cab so that there was ample room to rescue him. Their method worked and after 2 hours, he came out alive. He was then hoisted up with ropes in order to pull him to safety. 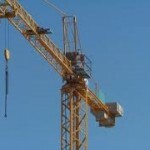 Presently, there is no indication as to the cause of the crane falling. The crane is relatively new and works well.